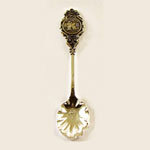 Silver-plated Cape Cod spoon. Medallion shows map of Cape Cod, Massachusetts. Measures 5" long.